The boat has been well maintained by me for the all maintenence every year since i bought it in 2000, boat has shore power, microwave, fresh water for sink, fridge, 2 110 outlets, battery charger, new 15 in flat screen with wall mount and swival, also i ran hidden cable in boat for easy hook up, outside cable conn, also i have a portapotty thats removable, it also has a hand held gps or you can use the mount it is 5/5 color cost $750. boat comes with everything you need to be a boater 1st or 2nd time, this boat has been noting but fun for me all these years. reason why i want to sell just got married and i think you know what's next for me starting soon. for any info that i left out please call. I;m asking 30,000 or best offer only serious inq. please also i can send pictures. 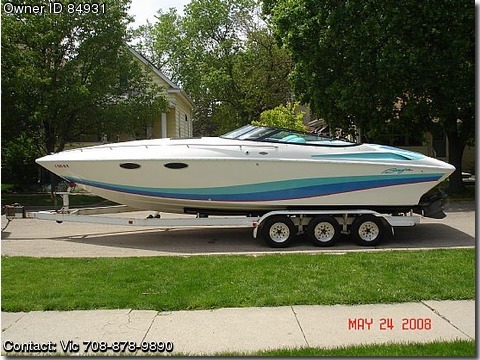 Its a go fast boat white blue interior, the name is the aggressor.